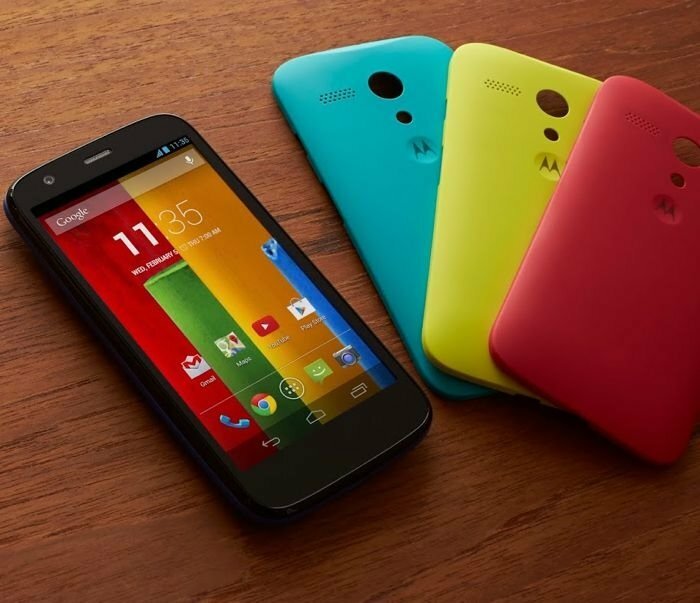 Not too long ago, we found out that Moto G is coming to the US ahead of its announced launch in January for $179 for the 8GB version — the CDMA version of the handset is still slated for January. At the announcement, Motorola mentioned that the colorful shells and flip covers are coming soon, which can help users customize their Moto G by using removable back shells. Well, Motorola’s online shop now lists Moto G Shells and flip colors in various colors, with an expected shipment date from December 2nd. 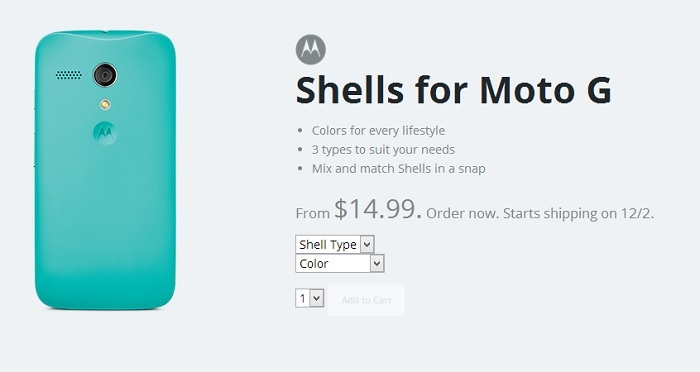 Moto G shells are going to set you back by $14.99 while the flip shells covers come with a $29.99 price tag. Many of you may consider these prices high, but you should accept the fact that Motorola is selling the Moto G at an extraordinary price. Motorola shells and flip shells are available in six different colors, including Chalk, Violet, Royal Blue, Turquoise, Lemon Line and Cherry. For $179, you’ll get your hands-on a 4.5-inch HD display sporting a resolution of 1280 x 720 pixels, a quad-core Snapdragon 400 processor with a clock speed of 1.2GHz and 2GB RAM. Other features include 8/16GB storage options, 5MP rear camera capable of recording 1080p videos with a 1.3MP front-facing camera for voice and video calls, Bluetooth, WiFi, 2,070 mAh battery and runs Android 4.3 Jelly Bean out of the box, with a promise that it will get Android 4.4 KitKat update early next year. We have all the reasons to believe Motorola about the software updates as the Google-owned company already released the Android 4.4 Kitkat for its Moto X on various US carriers.